I was checking GPU prices as I occasionally do and I found some very interesting discoveries. Both the R9 290X and R9 290 are widely available at $329 and $269 respectively. 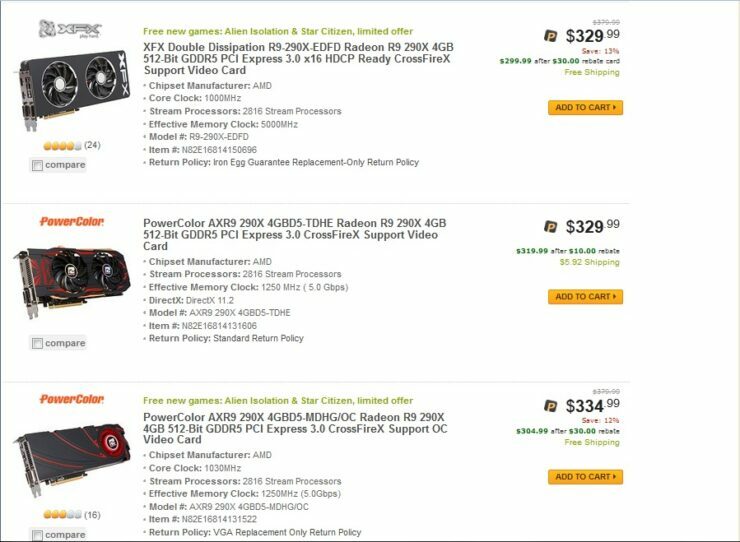 We’ve checked Amazon.com as well and the pricing seems consistent with what we’ve found on newegg. That’s considerably cheaper than the initial price reductions we reported on a few weeks back. In fact you can buy a custom cooled XFX R9 290X from Newegg for $299 after a $30 rebate. To put that into perspective, that’s a level of performance you had to pay one thousand dollars for last year. The R9 290X is now $70 less expensive than it was just a few weeks ago. And a whopping $220 less expensive than when it was first introduced. The R9 290 is more affordable as well, exactly $30 cheaper than it was at the beginning of the AIB promotions a few weeks ago and $130 less expensive than its original launch MSRP. Nvidia initially put pressure on AMD by positioning the GTX 970 at $330. Which makes this whole situation much more amusing. 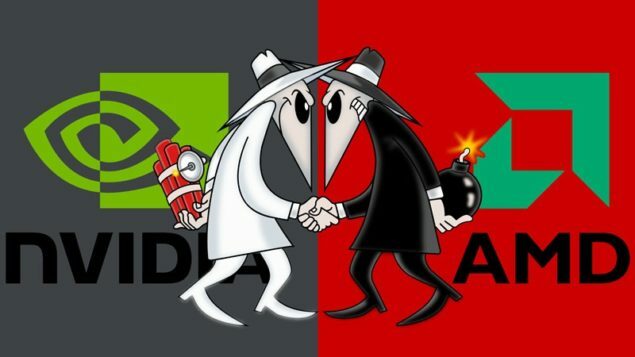 Because it’s AMD now that’s exerting pressure on Nvidia with the new pricing structure. The fact that Nvidia has been having supply issues with the GTX 900 series makes things even more complicated. Between the $330 GTX 970 and the $220 GTX 760 sits a $110 gap. A gap that occupies the mainstream discrete graphics segment. A segment that’s four times larger than the $300+ high end segment according to market analysts. Unfortunately for Nvidia this segment is currently a mess. It’s occupied by a three graphics cards, none of which is actually worth the money. The GTX 760 4GB, GTX 770 2GB and GTX 770 4GB. These are three graphics cards which have suddenly been made completely irrelevant by the new R9 290 positioning. 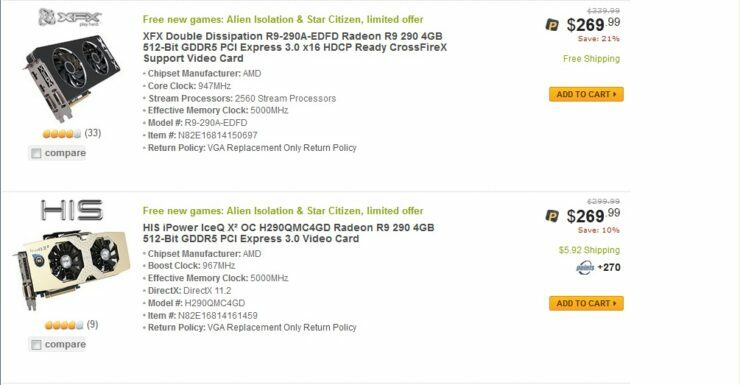 Amusingly just as the GTX 970 made both the R9 290X and R9 290 irrelevant at $550 and $400 when it was first introduced at $330. The R9 290 is unquestionably the fastest card in this segment and by a very significant margin. At $269 it has also become just as affordable if not more affordable than the alternatives in this segment. While AMD’s R9 290 is clearly a winner at this new price point. The situation is less clear cut with the R9 290X. The R9 290X and GTX 970 trade blows according to which game you play. On average they’ll perform indistinguishably the same. The GTX 970 uses 60 watts less than the R9 290X to achieve the same performance. While it might not seem like a lot (A CPU overclock would add even more watts than that to your system power consumption). It can still prove to be an advantage in small enclosures like mini-ITX cases. Especially if your card uses axial fans instead of a blower which end up kicking heat into your case. You can find custom cooled R9 290X cards from various AIBs between $30-70 cheaper than the GTX 970 with and without rebates. Both vendors also include a game bundle of some sort with their cards. Nvidia allows you to choose one of three new Ubisoft games. The Crew, Far Cry 3 or Assassin’s Creed Unity. AMD on the other hand allows you to choose three of 25+ games, ranging from brand new triple A titles to older popular games and even indies. The choice becomes even more difficult when you factor in variables such as G-Sync, FreeSync, TrueAudio, GameWorks, and Mantle. You could be swung either way depending on what your needs are and In this instance what it really comes down to is individual preference.